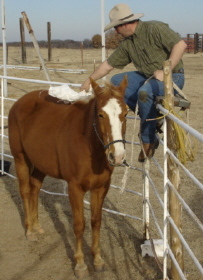 There are many variations on fence work with horses that you can try. Literally you can do just about anything from the safety of the fence. (There are a lot of people out there who just might not want to risk spooking a horse and getting thrown. This is one way to help the horse and yourself with some quiet, slow learning. you can slicker train your horse, get him used to plastic bags – or other noise makers such as a ringing cell phone (ugh, the thought). Or really anything – just let the sky and your imagination be the limit. Remember to go slow. For questions about Variations on fence work with horses, please contact us.